Whether you prefer a manual or a motorized wheelchair, there are advances in new wheelchair technology that can help with your overall mobility like never before. 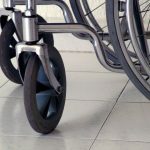 Decades ago, being in a wheelchair could be confining, and it was very difficult for many patients who experienced a sudden loss of mobility. As of 2019, new wheelchair technology and streamlined designs can help change your life for the better. Read on to learn a little bit more about wheelchairs and new wheelchair technology that can improve your quality of life. The earliest wheelchair technology dates back to ancient China, where a rock slate was used to help transport those with a disability. Advances in wheelchair technology in future centuries reserved wheelchairs only for royalty, and many of them did not even need one. In 1655, the first wheelchair that is similar to what we know today was invented by a paraplegic watchmaker. From this point, advances in wheelchair technology would take off, and the first truly motorized wheelchair was introduced in the United States in 1933. Since 1970, most wheelchairs (self-propelled and motorized) have an aluminum construction and similar design. Even with all the advancements in new wheelchair technology, manual self-propelled wheelchairs are still the most popular model used today. In part, this is because it gives a person much more control and freedom of movement. While it may be tiring to drive the wheelchair with your hands and arms, people overall like the feeling of control and mobility, and it’s easier to guide the device. Some new wheelchair technology when it comes to manual wheelchairs includes models that fold (which is great for traveling), and two-way wheelchairs, which are specifically designed for those with lower or upper body impairment. Part of a group of innovative wheelchair solutions, this type of chair is adjustable depending on your disability. For example, you can lower, raise, or swivel the seat to get your arms in just the correct position to guide the device. BMX sports wheelchairs also have new wheelchair technology for those who want to ride the chair like a bicycle. There are many advances in wheelchair technology in motorized models. There now is a wheelchair that you can control with your eyes, which is perfect for those who have full-body paralysis. Other wheelchair future technology includes options powered like a Segway, illuminated wheelchairs that can be seen well even at night, and two-seat wheelchairs that actually let you carry a guest with you, which is a great idea for events or other occasions. “Smart” wheelchairs offer wireless capabilities from apps to Bluetooth. Beyond new wheelchair technology, there are other advancements currently available to help make your life easier. Home modifications such as electronic medication dispensers and sensors to alert family members of your activity are proven devices to help you live longer. Accessibility ramps are a must for comfortably going in and out of your home. There are also advancements in accessible clothing, driverless cars, and virtual reality, all put in place to help you live your best life. If you are in search of new wheelchair technology, products, and services to help increase your mobility, contact Williams Lift Co. today to hear about our accessibility ramps, stair lifts, and other devices. With over 70 years in the mobility products industry, we’re committed to increasing your mobility.